The market in Franklin Half Dollars is heating up as more and more new collectors enter the market and discover what a bargain these coins are! 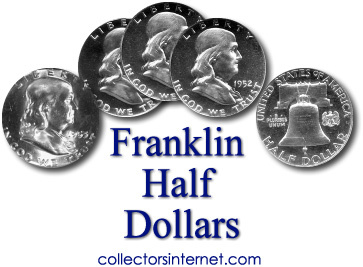 Here is an article, reprinted with the permission of the Beverly Hills Coin Club, listing seven reasons why highly-affordable Franklin Half Dollars should be on the top of the list of serious collectors and investors. We are so bullish on these coins that we have purchased over 50 complete sets of especially nice BU Franklins, and offer these, conservatively graded, at the bottom of this page for your consideration. 1. The Benjamin Franklin Half Dollar is a coin steeped in history and fascinating facts. Up until 1979, with the advent of the Susan B. Anthony Dollar, Benjamin Franklin was the only real-person, non-president, to appear on a coin designed for circulation. Mr. Franklin served as the first U.S. Post Master, he invented dozens of useful items, and he was a brilliant writer and statesman. John R. Sinnock, the designer of this coin, had his initials engraved in all of the Franklin Half Dollar dies, and positioned these initials below Franklin's bust. During those McCarthy-era years, paranoia got the best of some people, who complained that the initials JRS stood for Joseph Stalin. For yet another reason, Mr. Sinnock was later denounced for his design, as the Bell that appears on the reverse is very similar to the Sesquicentennial Commemorative Half Dollar of 1926. By law, the eagle had to appear on all half dollars since the 1790s. But since Franklin was synonymous with Philadelphia, the Liberty Bell seemed more appropriate. This conflict was resolved by designing the likeness of a very tiny eagle, which appears on all issues, at the side of the Bell. 2. Minted only from 1948 to 1963 (Only 16 years!). A nice BU complete set is far more affordable and easily attainable than other popular series. A complete set of nice BU Morgans or Walkers would cost over $50,000 per set! Yet, really nice Franklin sets can be had for under $1,000 ! 3. Many low mintage issues abound in this series, with an average mintage being far fewer than the average mintage of Morgan Dollars and Walking Liberty Halves! 4. Because of their relative recent mintage and availability at the time, millions were melted in the great silver melts of 1964 through1968 and 1979 through 1983. 5. The possible available sets in nice BU condition is limited to the least-available coin in nice BU, believed to be the 1949-S.
With a mintage of just 3,744,000, most of this date was heavily circulated as collectors of the time focused more on hoarding the 1948 first-year issues and the obsolete Walking Liberty Halves. Many market-makers believe that fewer than 10,000 1949-S issues survived in nice BU (Mint State 63 or better) condition. The Professional Coin Grading Services have graded only a few hundred in 63, 64 and 65 and less than a 100 in 66 or better. Therefore, in theory at least, the possible number of COMPLETE sets of Franklins available is probably limited to no more than approximately 10,000 at best. 6. The number of possible nice BU sets with Full Bell Lines (full lines on the lower part of the bell) is even more limited, as it is widely believed that there are many dates and mints in this series in which there are no more than a thousand nice BU examples with Full Bell Lines. Few dealers have very big inventories of these, with the exception of some of the bigger ones such as Bowers & Marena, CollectorsInternet, Collectors Universe and R & I Coin. The Professional Coin Grading Services have graded only a few hundred of each and every date with Full Bell Lines in nice BU. 7. At under $1,000 each for nice BU sets, and only a few thousand dollars for sets with Full Bell Lines, these sets are way under priced yet still highly affordable. I remember buying nice BU 63 sets for about $550 to $950 per set back in the early 1980s. Today, these coins can still be had for about the same price! Unfortunately, I sold them all, and am eager to start buying more again. There are not too many sets of large silver coins in the world that we can own for only about an average of $20 to $30 per coin. I think with the advent of the State Quarters, which are going to be continuously issued until the year 2008, the number of collectors entering the market will continue to grow and grow. It is often said that rare coins are "the poor-man's real estate", because like real estate, there is only a limited supply, but the demand keeps growing not only with the population, but with the increase popularity. I think all coins are a great buy these days, be they Large Cents, Walkers, Morgan or Peace Dollars. However, with such a limited supply of nice BU Franklins, along with the ease of putting together a nice set at very attainable prices, I think the Franklin Half Dollar will do particularly well for investors and collectors now, through the year 2008, and beyond. 90% Bell Lines or More! 95-99% Bell Lines! Full Bold Bell Lines!